There are 2 currentrly listings that match your search criteria. FR001- Factory for rent in Sankapang area Chiangmai Thailand. The factory for rent in Chiangmai Thailand. Just off Highway 1317. Approximately 23 km to Chiang Mai International Airport. Factory and buildings on 2 rai land. With option to lease another 9.5 rai that is next to it. Total 7 buildings plus 3 covered work areas. Total built in around 1700 square meters. 1 large factory, staff kitchen, dining area plus toilets and maid quarters. Showrooms and offices fully airconditioned. 40 ft container access, 3 phase 30 amps power supply. Attached 9.5 rai land is fully security fenced. 30 tonnes load bridge access from road. Road access all around the property. Option 2 : To rent 2 rai factory with complete licenses and machinery included and 9.5 rai land that is next to it : 150,000 baht per month. 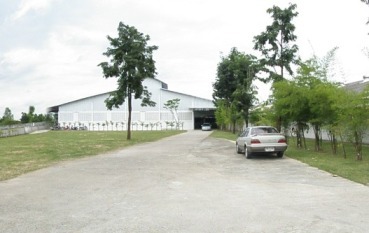 FR002- Factory for sale in Sankapang area Chiangmai Thailand. 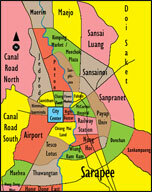 Chiang Mai, the second largest city in northern Thailand. 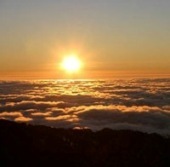 Chiang Mai is a world known location for its tourism and hospitality. The people are very friendly and hardworking. The food is excellent and the city offers all the modern amenities and boasts several golf courses. The factory is 8km from Chiang Mai in the city of Borsang. The factory is 25,000sqf on 86,000sqf of land. The entire factory is 3 years old. Rent is $4000/month or $925,000 to purchase.